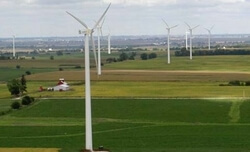 EDF Renewables North America has installed 3MTM Wind Vortex Generators (VGs) on their Chestnut Flats Wind Project in Logan Township, Pennsylvania. The installation follows the successful field verification testing of VGs installed on six GE 1.5sle turbines completed earlier this year at EDF Renewable’s Bobcat Bluff Wind Project in Archer County, Texas. The Chestnut Flats VGs were installed in May and June of 2018. The project was developed and built by Gamesa Energy USA, LLC, and was acquired by EDF Renewables in November 2011. Chestnut Flats utilizes 18 G90 and one G87 Gamesa turbines with a rated capacity of two megawatts. The predicted AEP increase for the project is 1.8% which will be verified over the next 4 months. VGs are small attachments made from durable materials that energize a flow around the blade and reduce flow separation. Due to the unique shape and properties of every wind turbine blade, the positioning of wind vortex generators is customized for each blade design. Additionally, the VGs are applied using 3M™ Acrylic Foam Tape, which accommodates the flexing and residual forces acting on the blade surface while still providing high adhesive strength in challenging weather conditions. EDF Renewables and 3M entered into a collaboration agreement last year to install 3M™ Wind Vortex Generators on wind turbines across the U.S.